What is Self-Storage and How Does it Work? Self-service storage, typically called self-storage, is a growing industry in the Greater Toronto Area. From an investment standpoint, self-storage facilities offer higher yields and they cost less to run than other commercial projects, for example, condominiums, due to a larger number of units that can fit into the same amount of space. Self-storage units are also easier to maintain and cost less to manage. For example, the break-even occupancy rate for apartments is approximately 60%, however, for storage facilities, it is only around 40% to 45%. Tenants can rent storage spaces, usually called storage units, on a month-to-month basis. These storage units can be rooms, lockers, containers, or outdoor spaces of all sizes. For consumers, these facilities offer safe temporary storage at reasonable prices. Self-storage tenants include both individuals and businesses. Self-storage facilities rent out units typically on a short-term basis, although some offer long-term leases. Individuals tend to use them as additional storage for household goods such as extra furniture and rarely used items. Businesses also use self-storage spaces for excess inventory, office furniture, or archived records. Many self-service storage facilities also provide additional services that may be needed when moving. Facilities may offer cardboard moving boxes, padlocks, packing supplies, and even moving truck rentals. Most facilities also provide trolleys or carts free of charge to assist in unloading storage items into storage units. For those concerned with the possibility of their items getting damaged or stolen, many facilities offer insurance. Individual storage units are secured under lock and key – with locks sometimes provided by the tenant. The facilities are also often secured with a locked gate for which all tenants have a key or an access code. Self-Storage is the fifth-largest and one of the fastest-growing industries in the U.S. Americans currently use an average of 9 square feet of storage space per capita, whereas Canadians only use around 2.5 square feet per capita of items in storage. The self-storage industry in Canada had a revenue of $840.4MM and profit of $80.7MM in 2017. There are approximately 1,349 self-storage businesses in Canada, but there are currently no major players in the market. According to the Canadian Self-Storage Association, 80% to 85% of businesses in the industry only manage one facility. The top four companies in the industry hold less than 20% of the market share. There is still plenty of room for growth in the industry, and it is predicted that the industry will maintain an annual growth of approximately 7.3% over the next five years. The industry also reported a profit margin of approximately 9.6% in 2017. Currently, the self-storage industry is booming in Toronto. The city has a unique demographic makeup that puts this industry in a good spot and provides many opportunities for new businesses and investors alike. For example, there are a large number of international students that need summer storage, and a growing population of empty nesters who are downsizing from larger houses to smaller condos and need additional storage for excess belongings. 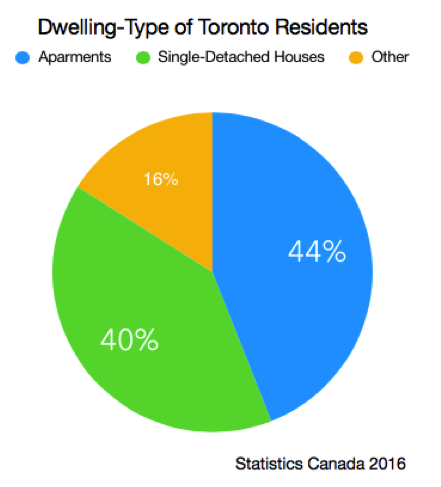 Toronto’s typical dwelling distribution in 2016 consisted of 40% of residents living in single-detached houses and 44% living in apartments. The percentage of residents living in apartments has dramatically increased compared to previous years, which can be attributed to the increasing aging population and the expansion of the apartment and condo market. Shifts in the population heavily influence the demand for self-storage. The 6 Ds – downsizing, death, divorce, displacement, disaster, and density, summarize common factors that directly increase the demand. For example, in Toronto, citizens aged 65 and older account for 15.5% of the population; around a 13% increase from 2006. This percentage is predicted to rise to 25% within the next 20 years. The increase will result in a higher demand for self-storage as seniors typically choose to downsize from single-detached houses to smaller apartments and store their excess belongings in a self-storage unit. However, the increasing aging population downsizing is only one of the many factors that drive the demand for self-storage units. All signs indicate that the self-service storage will continue to thrive and grow in the Greater Toronto Area.